We have been in Delaware three weeks, so I thought I would give a complete update of where Baby Todd is on Christmas day. He has the Berlin Heart doing the work for his heart, the VV ecmo doing the work for his lungs, and an ultra filtration system doing the work for his kidneys. 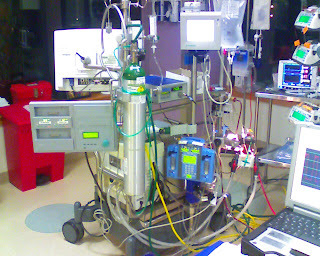 There is at least 4 large machines and a total of 23 tubes, lines, and wires attached to him. This morning there were an additional 18 wires attached to his head for testing of his brain. The doctors are very impressed he is still "intact" in his head and the tests today, at first look, did not show any concern. 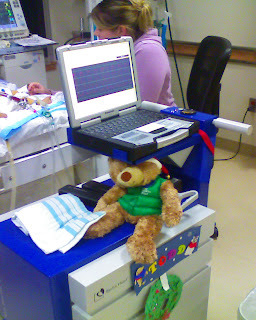 This is the Berlin Heart in the front and the Breathing Machine in the back. The doctors said a new heart would be a very good thing right now if one were to come available. Until then, they are doing every thing they can to keep his body functioning. Todd is still fighting even though the odds are stacking against him. We try to focus on the goods things and remember God has brought us this far for a reason. Today Jerri and I felt more home sick than ever, but we made the best of the situation. 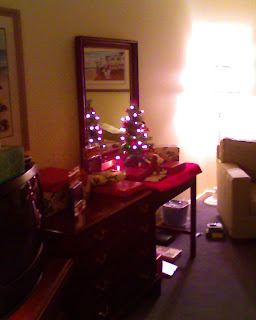 We put up a small Christmas tree in our room and put many presents under it. The girls didn't seem to mind the small tree because it still had the presents. We added a tractor theme, to make it feel more like home (we are so redneck). Sorry dad, we couldn't find red tractors so we added red bows. We had a great day opening presents and spending the day together. We went to the movies to watch "Marley and Me". It was a good movie for the girls and when it was over Kadenn said "the movie made my eyes water". So, take some tissues if you go to watch it. Todd was here to squeeze my finger one more day, so I believe God gave us a Christmas Maricle. We continue to pray for complete healing one day at a time and thank God for a wonderful Christmas. So proud of your faithful determination to worship the Lord in all circumstances! God is being glorified as you walk together with Him. Reading your daily updates makes 'my eyes water' (using Kadenn's words!). Your faith & complete trust in God is in incredible testimony to all!! I am praying for continued strength, guidance & extra dose of sunshine today. Christmas blessings to you. Thanks for the daily update. The Possinger's are praying for you as you continue to trust in God for EVERYTHING. I am so glad you were able to spend Christmas Day with your three Children. GOD IS GOOD ALL THE TIME. We love you all and are praying for you. 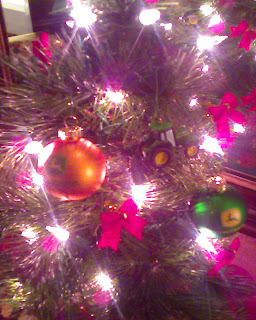 I love your tractor tree! So glad that the girls were able to be there and that you guys could spend the day together. Even though you guys were away for Christmas you were still here in our hearts and prayers. Thank you for the update on little Todd. We will continue to pray that God will bring healing to your little guy. May you have a day full of little finger squeezes. Keeping vigil in a hospital away from home for 5&1/2 weeks with a loved one hanging in the balance is one of the hardest things I've ever had to do. And so I feel for you being away from home and family and dealing with the daily uncertainty of Todd's condition. I've told friends that there seems to be a pall hanging over Christmas this year as I go through the motions of Christmas while thinking of you and of Todd's dire situation. But we'll keep Trusting God for His Perfect Will for Baby Todd's little life, and we especially pray for a heart for him. We think about your family and pray for you daily. Wow - what a testimony & witness to God's grace, peace & strength to get you through a trying situation. What a blessing that the 5 of you could be together for Christmas day! I was thinking about you all alot as we were having our own celebration on Christmas day. Proverbs 3:4-5 & Jeremiah 29:11 are verses that were helpful to each of us during our own trials in life. Maybe they will be of comfort to you as well. Hang in there and keep looking up! We love you, and pray for you often!